Doctors test for white blood cell (WBC) count to measure the number of white blood cells in your body. This blood test is usually done as part of a standard complete blood count (CBC) test. White blood cells are also called leukocytes and they are part of your immune system. They attack germs, bacteria, and microbes that can cause infections or inflammation. White blood cells can be divided into five main types: neutrophils, lymphocytes, monocytes, eosinophils, and basophils. Usually, blood test results show elevated white blood cell count if you are fighting an infection or have an inflammatory condition. Pregnancy can also cause a high or slightly elevated white blood cell count. However, other factors like stress, smoking, or allergies can elevate your white blood cell count. Doctors also check for abnormal WBC levels if they suspect an autoimmune condition, blood disorder, or problem with your immune system. There are not always obvious symptoms if your white blood cell count is outside the normal range. A high white blood cell count could be accompanied by symptoms of a viral infection or allergic reaction like fatigue, runny nose, coughing, or digestive upset. There are also some medical conditions that cause your white blood cell count to drop lower than normal. In this article, I will look at the various reasons that can cause a high or slightly elevated white blood cell count. In most cases, lowering white blood cell count involves treating the underlying cause. However, there are also some natural ways to help bring your white blood cell count within the normal range. What is Normal WBC Range? Even though white blood cells only make up 1% of your blood volume, they play a vital role in keeping your body’s defenses healthy. Your bone marrow constantly produces white blood cells in case germs, viruses, or bacteria threaten your health. Of course, there may be slight variations depending on the lab carrying out the blood test. Neutrophils. These WBCs destroy bacteria and fungi and are your first line of defense when there is an infection. Lymphocytes. Defend against harmful viruses or bacteria by creating antibodies. Monocytes. Kill bacteria invading your blood supply. Eosinophils. Effective in destroying parasites and cancer cells. Basophils. Secrete histamine and react to allergens in the body. What is Considered High or Elevated White Blood Cell Count? Dr. Hina Naushad, a hematopathologist from Creighton Medical Center, says that an elevated WBC count is when the total number of leukocytes (white blood cells) is more than 11.0 x 109 per L.
Testing for these types of white blood cells is sometimes called a differential white blood test. 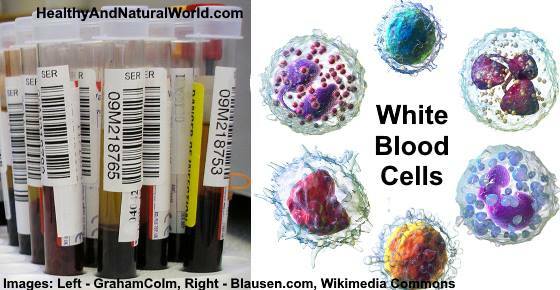 High White Blood Cell Count – What Does it Mean? A high white blood cell count is called leukocytosis and can mean that your body is dealing with extra stress. This can be in the form of an infection, inflammation, injury, allergic reaction, or emotional stress. Bacterial infections caused by Strep or Staph strains of bacteria like cellulitis, strep throat, or bacterial pneumonia. Asthma or allergies that cause an inflammatory response in your body. A side effect of certain corticosteroid medications. Sometimes, you may have higher than normal or slightly elevated white blood cell count without any symptom. If this is the case, your doctor will usually arrange for a second WBC blood test to determine the reason. Doctors may also test for signs of leukocytes in urine and stool to help diagnose digestive disorders or urinary tract infections. Let’s look in more detail as to what it can mean if you have too many white blood cells. The most common cause of higher than normal white blood cells is because your body is fighting an infection. The presence of germs, bacteria, or viruses signal to your body to produce more WBCs to destroy the pathogens. Doctors may test for a high white blood cell count to help diagnose the severity of certain inflammatory conditions in the body. Left shift WBC or leukocytosis with left shift means that there is a high number of young, immature white blood cells in your blood. This happen when the bone marrow is producing more white blood cells and releasing them into the blood before they are fully mature to fight the infection or the inflammation. Checking for elevated white blood cell count can also help doctors diagnose the severity of coronary heart disease or a stroke. Rheumatoid arthritis is another inflammatory condition that can cause the number of white blood cells to rise higher than normal. There are a number of ways to treat the symptoms of arthritis naturally. For example, foods rich in omega 3 fatty acids, as well as fruits and vegetables rich in antioxidants, are foods that help manage arthritis inflammation. An elevated high white blood cell count can mean that you have an allergic reaction to specific allergens. An allergy is an overactive immune response from your body to substances that are generally harmless. One way to reduce allergy symptoms is to use natural antihistamines to reduce swelling and a runny nose. Also, certain essential oils have anti-allergy properties that can help to clear sinuses, reduce inflammation, and soothe itchy skin. In some cases, an immune disorder can cause a slightly elevated white blood cell count. Emotional or physical stress can cause inflammatory responses in your body that can result in high WBC and high neutrophils. Some ways to reduce stress and look after the health of your heart is to enjoy a healthy diet and get plenty of exercise. Certain problems with your digestive system are connected with inflammation and can be a reason for elevated WBC. If you smoke, you may find that complete blood count test results persistently show high readings for your white blood cell count. The normal WBC range for pregnant women is significantly higher than for the general population. There are some other, less common, reasons for having too many white blood cells in your serum. Usually, having a high WBC count is nothing to worry about, and white blood cells return to their normal range when the infection has cleared. What can you do to help lower the number of white blood cells if they are slightly elevated? Drink ginger tea with turmeric for their antimicrobial and anti-inflammatory properties. Take a spoon of raw honey for its antiviral and antibacterial properties to help clear strep throat and upper respiratory infections. Use garlic as a natural antibiotic to help clear lung infections and give your immunity a boost. Incorporate more foods and herbs in your diet that have anti-inflammatory properties. Look after your cardiovascular system by lowering blood pressure and reducing dangerous levels of cholesterol. Boost your immune system with these natural herbs and supplements. Because psychological and emotional stress can cause WBC count to shoot up, it’s important to find ways to manage stress better. For example, there are many essential oils that are great for stress relief. Bergamot essential oil, lemon oil, lavender oil, and wild orange can help to soothe frayed nerves and induce a feeling of calm. Also meditation, yoga and other stress management techniques can help to reduce stress levels. Stopping smoking is one of the best ways you can do to improve your health and reduce your risk of many diseases. Some of the benefits of kicking this habit are that your blood circulation improves, the health of your lungs and heart gets better, and you reduce your risk of stroke. Please read this article for ways to help quit smoking today. Fish oil or omega-3 supplements are one of the super foods that help reduce inflammation. Taking omega-3 supplements can help to reduce your total WBC count because they prevent a number of inflammatory diseases. When supplementing your diet with omega-3 fatty acids, it’s important to make sure that they contain DHA and EPA – long chain fatty acids that are mainly responsible for the health benefits. Vitamin C is an important antioxidant that is essential to keep your immune system working properly. A healthy immune system is able to fight infections more effectively and prevent the body from producing excessive numbers of white blood cells. You can also reduce inflammatory responses in your body and lower white blood cell count by switching to the Mediterranean diet. Am Fam Physician.2015 Dec 1; 92(11): 1004-1011. URMC. What are white blood cells? LabTestsOnline. White blood cell count (WBC). Scand J Infect Dis.1993; 25(4): 435-40. J Cytol. 2015 Apr-Jun; 32(2): 79–84. Am Fam Physician.2000 Nov 1; 62(9): 2053-2060. Am J Epidem. 2001 Oct; 154(8): 758-764. ClevelandClinic. Arthritis & blood tests. WebMD. Blood testing for allergies. Ind Health. 2014 Nov; 52(6): 531–534. CarringtonEDU. Link between mental stress and physical health. Medscape. Clostridium difficile colitis workup. Prev Med Rep. 2016 Dec; 4: 417–422. Am Fam Physician.2000 Nov 1;62(9):2053-2060. J Am Col Nutr. 2002; 21(6): 495-505. Nutrients. 2017 Nov; 9(11): 1211. Hematology. Study further illuminates heart-healthy benefits of Mediterranean diet.